FILE - Cuban doctors arrive at the Jomo Kenyatta International Airport amid controversy surrounding their pay in Nairobi, Kenya, June 5, 2018. Kenyan doctors are seeking to block the government’s plan to deploy 100 Cuban doctors to fill gaps in the country’s health care system. A group of unemployed doctors filed a lawsuit against the move, arguing that as citizens, they should have been hired first. But the Kenyan government has defied a court order blocking it from hiring the Cubans. Despite opposition from Kenyan doctors and sections of the public, Kenyan health officials are going forward with a plan to use Cuban doctors in the country’s public health care facilities starting next month. In doing so, the government also is defying a court order suspending the employment of some 100 doctors who arrived in the country last week. A petition was filed by four Kenyan doctors. Their lawyer, Anangwe Maloba, says the doctors feel discriminated against in terms of employment and pay. “We are submitting that the decision to pay Cuban doctors a higher or a better remuneration package than the local ones is discrimination, that they all ought to be a similar remuneration, they ought to belong same job group. The second point was that for the unemployed specialist doctors is that they are almost 171 specialist doctors who have not been able to secure employment to public health facilities,” said Maloba. Kenyan media reports say the Cuban doctors will be paid at least $8,000 each month. The doctors also will get free housing, transport and airfare. FILE - A patient accompanied by a visitor is seen walking inside Kenyatta National Hospital in Nairobi, Kenya. Rashid Aman, the chief administrative secretary at the Ministry of Health, says the Cuban doctors are needed in county hospitals. “Last three years, 156 medical specialists completed their studies at the University of Nairobi and Moi University, which are our two largest teaching hospitals and were posted out to the counties. 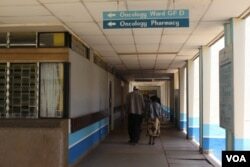 This number could not breach the gap in health needs in Kenya,” he said. But Edgar Wachika, a lawyer for the Kenya Medical Practitioners, Pharmacists and Dentists Union, says laws were not followed in recruiting foreign doctors. 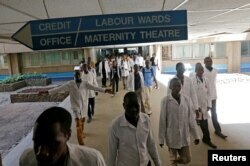 FILE - Kenyan student doctors walk towards the labor wards at the Kenyatta National Hospital during a doctors' strike in Nairobi, Kenya, Jan. 19, 2017. “The union’s interest in the matter is to safeguard the interest of these Kenyan doctors. Where these Kenyan doctors are not employed and there are positions they could fill themselves. Yet these positions are offered to foreigners. Obviously this does not sit well with the union and its members,” he said. The court of employment and labor relations is expected to issue a ruling next week on the Cuban doctors. The question is, will the government heed its decision?